Keeping your eyes protected on the slope is essential but why choose comfort and practicality over style? With these ski goggles, you have both at the same time. These are a great all-rounder when it comes to taking up skiing. They’re very popular and it’s easy to see why with an interchangeable lens system that you can change in just two clicks. Available in green, black and a white ‘crackle effect’ pattern the ID2 pro goggles allows you to change your lens in snowy conditions and again to the second lens for improved light filtration when the weather improves. 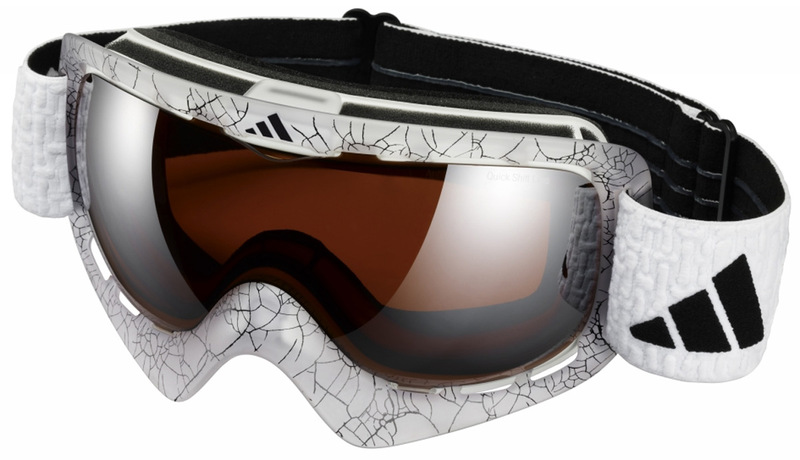 The way Adidas have designed the pair prevents you from having to remove and change the lens manually, perfect for ski beginners. Recon have introduced the latest in ski goggle technology: the MOD live. The instrument attaches to any pair of Recon-ready goggles (Alpina, UVEX, Briko and Zeal Optics) and transforms them into a GPS-enabled pair. They are non-obtrusive, offering real-time feedback which includes speed and altitude analytics. They can also notify you of the temperature, and time and when linked up with any Android smartphone they’ll provide navigation, resort points, text messaging and ‘buddy tracking’-a system that finds your other MOD Recon-ready friends. The Bolle collection is a favourite amongst celebrities such as Matthew McConaughey and Mickey Rourke for their performance and style. The lenses on the ‘gravity’ keep them fog and scratch free and they come with a waterproof breathable vent which works by equalizing air pressure between the lenses and preventing any moisture build up. The ‘gravity’ comes in a classic black with blue or red lenses. For the most stylish ski goggles on the market there is nowhere else to look but the Zeal Optics ‘level’ design. With five different styles to choose from, each featuring a unique element such as custom patchwork or a textile inspired pattern luxury oozes out of each goggle. The oversized series is also practical, featuring anti-fog and high density lenses.